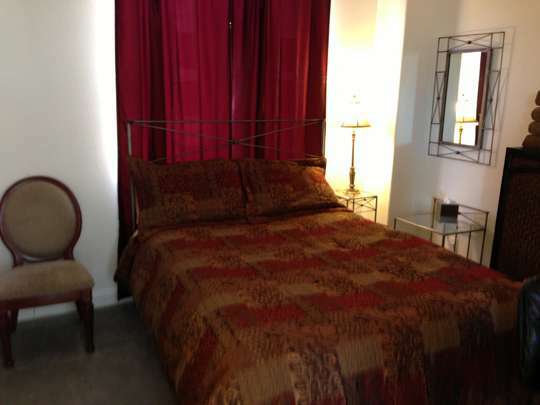 This private room has a queen bed and is located upstairs. A shared full bath with double vanity and a separate room for shower and toilet is adjoining. Room amenities include a writing desk with task chair, plus two more room chairs. A spacious closet contains a chest of drawers and the room has another one. Ideal for the guest who likes to be organized with plenty of storage options. This room is great for a single person or a couple. Residence front door has a wireless keypad with individual guest access codes assigned upon arrival. This guest room has a key and wireless keypad door lock with an additional double sided manual lock for the adjoining bathroom door. Rates include room accommodations, personal training, and wellness coaching, your choice of authorized foods provided for 4 supervised and self-prepared meals + 2 shakes and bottled water. To view, the accommodations click here. Listed are base rates that do not include the $50 per day special needs upgrade. Special needs include private bath or suite, geriatric or morbidly obese accommodations. Parking for guest vehicles will require an additional $20 daily fee per vehicle. All room guests will have access to all of the common areas located on the first floor of the residence. This includes access to a full kitchen to choose from a selection of host provided whole foods to prepare your own meals. A common area is available for guests to use with multiple tables, an area with couches and a TV with a DVD player, cable television, and free Wi-Fi. A laundry room is available as well so guests are able to do their laundry during their visit. Outside is a large patio area with a gas grill and stone deck raised to view the Vegas Valley and Las Vegas Strip. The back yard allows gated access to a quarter-mile scenic paved trail overlooking the golf course within the private community. The Fitness retreat rooms are only available to clients. Rates include room, semi-private personal training, and choice of self-prepared foods provided.